“Yesterday’s incidents in Parliament are disgraceful and shameful. It is a blow to people. The members of the SLFP and the Pohotuwa prevented the Speaker from coming into the chambers. He was about 45 minutes late when he could walk in. They attacked our MPs, several of them including MPs Gamini Jayawickrama Perera, Malik Samarawickrama and Vijitha Herath were injured,” he said. “The House has however passed a no-confidence motion under clauses 47(1) and 47(2) of the Constitution under the instructions given by the President to amend it before submitting it to a voice vote. Therefore majority has every right to have their say,” he added. 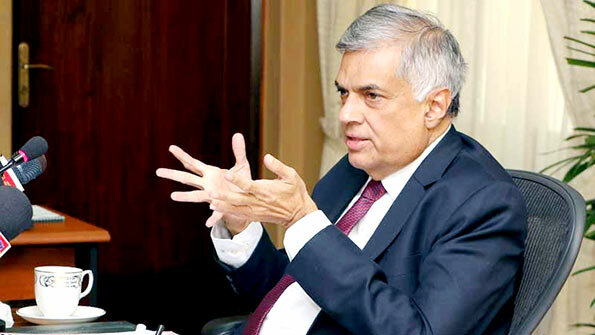 “The voice vote is legal as such a vote can be exercised in the House initially while resorting to other forms of voting only when a member calls for a division under parliamentary Standing Orders and Traditions,” Mr. Wickremesinghe said and asked whether those who did not heed the majority voice in Parliament accept the people’s verdict at an election. Go man go. We don’t want you. Ranil is too refined for SL politics and coming from good family background . The issues is , Veddo do not know how to use a comode in a modern day toilet . Its same with our MPs.Some MPs are brainless sickening 5 th grade fail idiots in the parliament. As a country , our people are educated as per literacy rate 90% above but .intelligence is less than 5% . ronnie is entitled to his opinion regardless of as to whther he falls into 95 percent of the less priveleged for if he considers him to be enlightennned he would not not make these crappy statments. ranil has not even a simple majority to call any shout.he failed miserably to lead a coalition with more than his party mustered . recent events in parliament demonstrated what it stands for and the governments never stood for democracy and if successive governments failed to serve the people parlimentarians are less inclined to stand for those who voted for. poltics is a job in trying to figure out ways and means means oof recover thier invest in politics and maybe a bit more.